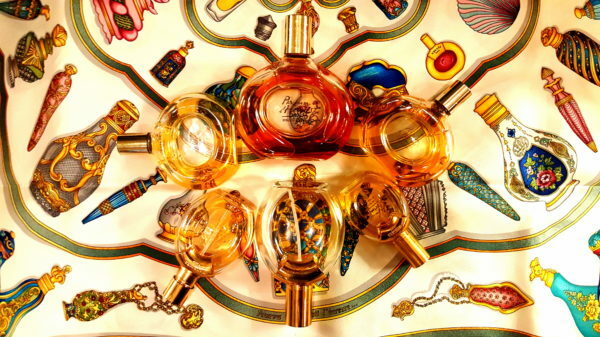 Today, we’ll continue to explore vintage Parfum d’Hermes, looking at its scent over the 1980s and 1990s. I managed to make the comparative analysis much shorter than I had anticipated, so I’ve included the technical bottle, packaging, and dating analysis here, thereby avoiding the need for an additional Part III. Let’s get straight to it. Vintage Parfum d’Hermes, 1980s and 1990s EDTs. Note how the scarf has a small Parfum d’Hermes bottle on the upper right side, in-between two of my bottles. Photo: my own. A shape-shifting chameleon, a night rider traversing through a verdant chypre valley to lay claim to a rubied rose atop a pile of oriental treasure, and an unabashedly 1980s-style “take no prisoners” floriental-chypre hybrid, Parfum d’Hermes is many things but always, in my opinion, an under-appreciated classic masterpiece in its earliest formulations. Age is key. Depending on the year of the bottle you try, it might exude such a naturalistic, heady, and complex 3D rose that it feels as though bucketfuls of beefy Ta’if flowers had been drenched with rich Nombre Noir-style damascones — a rose so grandiose, riveting, and naturalistic that it brings a rose hater like myself to my knees with awe. Then again, with another bottle, it might simply be a green-red damascena rose wafting a crisp, cool hauteur. In both versions, though, it gradually turns gothic and dusky, withered with frankincense and myrrh before being sheathed in a masculine gauntlet of smoke and leathered resins. Well, that is unless you have a bottle from the end of the 1990s, in which case things go in yet another direction still…. 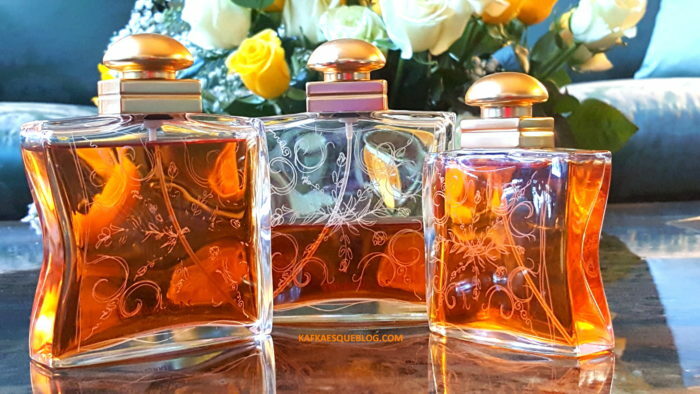 When I was in my 20s, one of my signature fragrances was Hermès‘ 24 Faubourg, an opulent chypre-oriental powerhouse created by the legendary Maurice Roucel. It was centered on luminous, creamy, heady florals which Monsieur Roucel sheathed, first, in multifaceted mossy chypre greenness laced with peach, then in oriental clouds of golden amber layered with real sandalwood, creamy vanilla, spicy resins, and a sliver of leatheriness. The fragrance feels like the more feminine, white floral cousin of Hermes‘ 1984 floral-leather-chypre, Parfum d’Hermes (reformulated and renamed in 2000 as Hermes’ Rouge) and Puredistance M (directly modeled on Hermes‘ 1986 vintage Bel Ami) during their middle chypre-oriental stages. The eau de parfum version even has a phase which is like a white floral twist on the 1930s-1970s version of vintage Mitsouko extrait. On top of that, vintage 24 Faubourg also inhabits the same world of rich chypre-florals as Givenchy‘s famous 1984 Ysatis, although the Hermes scent has a greater oriental underpinning and I would argue that it is much grander. Its richness, heaviness, and ornate complexity not only result in a very baroque regalness, but also somehow manage to ooze money and wealth in the most tasteful, elegant way imaginable. That may be why 24 Faubourg became the signature scent of the most glamorous princess of her era.